Being Frugal and Making It Work: Get $5 When You Sign Up For Swagbucks in January! 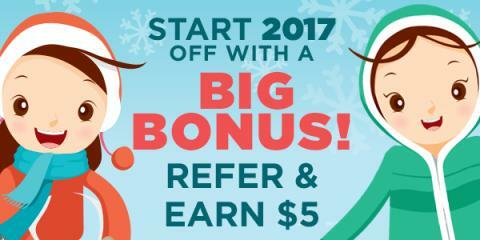 Get $5 When You Sign Up For Swagbucks in January! Now that the holidays are over, a lot of us have gone into savings mode again as we rebuild our bank accounts from all that gift buying! Some of us have already started saving for the 2017 holidays! If you're looking to extend your budget or just say within it, Swagbucks is a great resource for that. I use Swagbucks all year long! I redeem my SB for FREE Amazon gift cards, bank them up all year, and then use them to purchase Christmas gifts for my kids! It's the perfectly frugal way to get the kids what they want without breaking the budget! You've probably seen me write about Swagbucks a lot on here. It's a site where you earn points (called SB) for things you're probably doing online already, like searching, watching videos, discovering deals, and taking surveys. Then you take those points and exchange them for free gift cards to places like Amazon, Starbucks, Walmart, Target, or PayPal cash. 2. Earn 300 SB total before 2/1/17. You'll get a $3 (300 SB) bonus for it! That's it. It's super easy, and Swagbucks is for real. I use it myself, and I've earned over $1000!